This is one of the most intoxicating, wild, and imaginative science fiction novels I’ve had a chance to read. The introduction by Cory Doctorow compares it in terms of broad thematics to 1984 and Brave New World, with good reason, and I understand why Doctorow would return to this novel to reread again and again. The text of this story is an example of literature at its purest, as a representation of the universe which this story is set, in all of its nature grandiose, yet always seeming artificial, a veneer of shine over something hidden and more base. The flowing complex structure of McDonald’s latinate prose is thus peppered throughout with brief moments of Anglo-Saxon coarseness, and punctuated with repetition of simple sounds or ideas. Beyond the impressive nature of the writing, the characters are not too finely developed, they instead serve to bring schism into the Compassionate society of the story in order to bring highlight to the themes of McDonald’s tale. In this respect it reminded me somewhat of a Heinlein story with its almost Messianic heroes, such as “Stranger in a Strange Land”. As alluded above, the themes of this book deal with dystopia, a society that values attainment of comfort and happiness to any sort of freedom or risk. 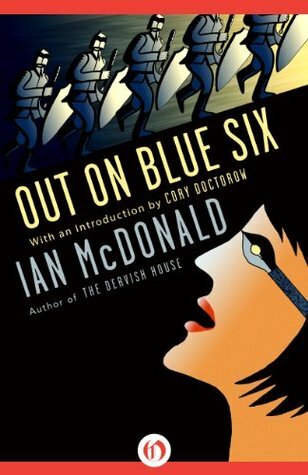 In its totality “Out on Blue Six” has interesting things to say about the nature of pain and the role of discomfort in driving things of value, art, and beauty.